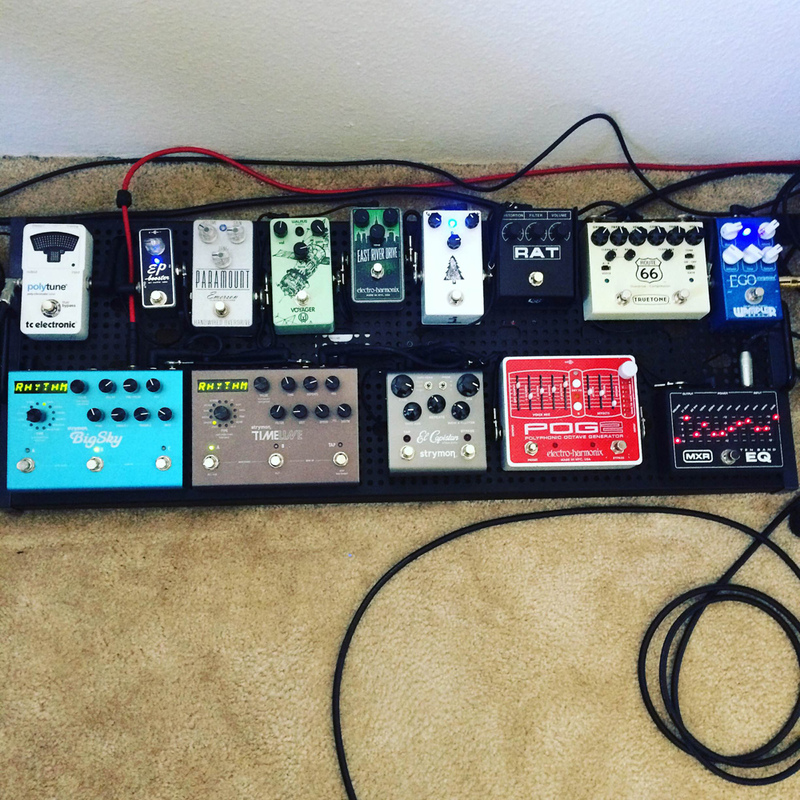 Today’s Pedal Line Friday submission is from James Honey. If you have a pedal line (doesn’t have to be in a board) for your rig, please email me a photo, bio, description of pedals and routing to pedalline@nulleffectsbay.com. Every Friday I’ll showcase a pedal line submission. Make sure you include any links to your band or music page. Routing/ Signal Chain: Guitar goes into the Ego Comp, into the comp side of the Visual Sound Route 66 V3, into the OD side of the same pedal, next is the Pro Co Rat, The Blackeye Effects White Pine, EHX East River Drive, Walrus Audio Voyager, Emerson Paramount, Xotic Effects EP Booster, TC Electronic Polytene, (sometimes a Morley Little Alligator Volume Pedal,) MXR 10 Band EQ, EHX POG2, Strymon El Capistan, Strymon Timeline, and finally the Strymon Big Sky. All this runs into a Backstair HT-60 with a BBE Sonic Maximizer in the Effects loop. Aside from the volume and BBE, these are all affixed to a Temple Audio Duo 34 pedalboard. Visual Sound Route 66: I honestly bought this pedal entirely because of hearing Jon Carolino’s (https://www.youtube.com/user/nightbulb42) setup on his YouTube videos. I enjoy the flavor of the overdrive and use it for medium aggressive overdrive gain. I use the comp side for a slightly more squashed tone when a song calls for it. Pro Co Rat: This is my highest gain pedal. I use this for leads primarily. Typically I am using this with a washed out big reverb setting on the Big Sky to allow for an ambient yet cutting lead on the top of the mix. Blackeye Effects White Pine: I was browsing pedals on rogue guitar shop for the sole purpose of discovering pedals I have not heard of before, but would enjoy. I stumbled across the White Pine, searched on YouTube, and found a video by a guy I respect and who’s tones I tend to deeply enjoy. The video is here (https://www.youtube.com/watch?v=1xhWqwInw3o) I love the beef and body it gives single coil pickups particularly on Teles. I tend to set my amp pretty focused towards presence over resonance, and I love using this pedal to thicken up lead lines or to give me that resonance for a rhythm part. EHX East River Drive: fun story with this one… I had never heard it before, only seen it in a Musician’s Friend Magazine a few years ago. I was driving to work last year, and “East River Drive” popped clearly and loudly into my head. I couldn’t remember what it was, so I googled it on my break at work, and purchased one on Reverb.com for $40. I LOVE the tone and flavor this thing gets. It is probably my favorite drive of all time. I was so impressed I actually contacted EHX to let them know haha! Walrus Audio Voyager: I love Walrus Audio products. I had not heard of them until stumbling across Andy Othling’s YouTube page (https://www.youtube.com/user/tubescreamer) a few years ago. I saw the Voyager on his board and the Mayflower as well. I enjoyed the tones he was getting out of it, did some research and decided on the Voyager over the Mayflower. I love it’s transparency and have used it both for medium and low gain settings. I plan on purchasing more Walrus Audio products in the future… most likely the 385 overdrive, and the deep six compressor. Emerson Paramount: The Paramount is another interesting story. I actually heard several different guitarists (primarily Jeffrey Kunde of Jesus Culture) using the Emerson EM-Drive on their boards. I purchased the Em-drive and was highly disappointed with the tones i was getting. It just did not work well with my current setup. I traded it straight for someone’s Paramount on Craigslist in San Francisco before a Fall Out Boy Concert! This pedal i use entirely for low gain settings. I have also been experimenting with using it as an “always on” effect to have a slightly broken up clean tone. We will have to see! This ends the “drive section.” Now quickly, the number one question I get about my board, is why so many drives? I am a worship guitarist as well as a song writer. These drives allow me to stack gain stages, have different pedals set for different guitars i play in the same set, and the different flavors of each inspire my song writing in different ways. Xotic EP Booster: I cannot even remember how i discovered this little guy. The concept here is to emulate the tone you can get out of a vintage Echoplex. For me, it really just warms up the tone after the drive stages and send a healthy fat signal into the next row of effects. TC Electronic Polytune: the tuner goes here simply because it fits well here on the board and does not cut off the trails of my time-based processing when I hit it and my signal mutes. it’s also super bright and easy to use. Morley Little Alligator: This thing is built like a tank, has a great sweep, and it finds its way into my signal chain occasionally. Sometimes the volume knob is enough, sometimes i want the pedal… it’s just a preference thing. MXR 10-band EQ: I acquired this one quite awhile back, and I honestly cannot remember at all why i originally got it. It sat on a shelf for quite awhile, and has found its way onto Craigslist several times. It’s a great little EQ, I just have not had a use for it. However with my new setup, it’s a perfect solution to balancing two different guitars in a set. I set the amp up for my Tele or Schecter and then set the MXR up to tailor my Hagstrom Viking or Gretsch Electromatic tone to keep that heavier presence sound while still affording the more rhythmic resonant tones that those guitars offer. EHX POG2: This recently replaced the Nano Pog on my board. I wanted a POG primarily for chord and lead swells. I also quickly found myself using it to lay down a bass line while looping when coming up with song ideas or just practicing. I got the Nano Pog at a good price on Reverb, and decided to upgrade to the POG2 to see what having the expanded options provides. There’s controversy over the POG2 vs Nano vs Micro etc… I still have the Nano and whether or not it will be sold or swapped back in remains to be seen. I’ve toyed with the idea of running both and using them to quickly access two different settings. Strymon El Capistan: This is the most recent addition to my board, and I have been waiting a long time to add this guy. I first heard it through Andy Othling as mentioned earlier, and then ended up looking into Strymon across the board. I realized that Strymon products were pretty much standard in the type of music i play, so i did a lot of research and comparison. It took so long to add this guy because I managed to get ahold of the Timeline and Big Sky sooner, but I knew I still wanted to add it. More Strymon is likely to come in the future. I am deeply impressed with the quality as well as the friendliness of the guys at Strymon. They are super personable and have talked with me directly through YouTube and Instagram. I use this pedal mainly for lush tape delays and love to layer it with the Timeline. I do have a plan to get this pedal modded to accommodate and external tap tempo (Disaster Area Designs TNT) pedal so I can run the timeline and el cap on the same tap. Strymon Timeline: I could go on for pages about this pedal. In my eyes it is the ultimate delay, and I simply needed to have it. Everything is tweak able, it’s easy to use, has a looper, and tap tempo. I just love the lush settings and being able to use it for any kind of delay imaginable and for ambient tones. BBE Sonic Maximizer: This one seems to be point of controversy for some musicians. Thinking as a studio engineer, it is easy to understand and hear what this little box does. DAWs often have some kind of sonic enhancer plugin. The concept is that the plugin (or in this case the pedal) fills out the surrounding frequencies on the low and high end of the spectrum in my sound. I personally love the sound it gives me in the effects loop of the amp. I use it to contour the low and high end after everything else to match what i am feeling, the room, and/ or the set. I love this little guy, and it actually led me to purchase the 882i dual stereo rack mount version for my home studio. Temple Audio Duo 34: I was researching large sized pedal boards as I have been running a Pedal Train PT2 in the past. I stumbled across Temple Audio, was intrigued by the design and concept of these boards. I was also impressed by the reasonable prices. I decided to go for it, and fell in love. I am planning on upgrading to a trio 43 (their largest size) in the future. Voodoo Labs: under the board, I run to Voodoo Labs ISO-5s as well as a Pedal Power 2 Plus. Voodoo Labs are trusted quality power supplies, and having tried the cheap knock off power brick route, I know that clean power is a MUST for quiet reliable power. Me: I have played guitar since 2007 and been singing since 2009. I am a singer/ songwriter. I also have played lead and rhythm guitar in worship bands at various churches. I have also led at several churches. I have a 14 song all original album from 2011. Worship music has a “sound” associated with it. Think The Edge or U2. It also requires musicians to think on their feet, adapt the song as they go, follow the leader, and improvise. Having a plethora of tones and options to stack and combine at my feet allow me to contribute and create with my tone as much as i do with my fingers. Having all these options also gives me plenty of inspiration for song writing. Many bands and song writers will tell you that hit songs and all time favorites have most definitely been written because of certain effects. Your choice of effects in the moment actually makes you play differently. I play differently and come up with different things when I have the Voyager engaged vs the White Pine vs a stack of several cascading drives on the board. I have not updated my band page in a long time but have a Facebook band page. I am also going to include links for a few songs (one more recent and several faves off the old album.) Thanks for taking the time to read through this insanely long email!! I agree with your comment on the BBE Sonic Maximizer. Mine is “ON” all the time now for the past 6 years. Awesome board! Interesting signal routing!